I’m not the parent I thought I’d be. I have incorporated some “strategies” and allowed some things that I never anticipated. I believe this was a result of being young and ignorant, and not understanding how eventually, the children just take over. They outnumber you, so you just throw your hands in the air and lower your standards. A lot. On cleanliness. On order. On so very many things. Then also, age and life just change your priorities. Here are some of the things I have done as a parent that I would have NEVER expected of myself. Let my kids wear things from the dirty clothes hamper. This sounds bad enough, but I can lower the bar more and say that I sometimes wear things from the hamper and floor. I blame my husband. I used to be the tidiest person alive. He has completely ruined me. Give up on “making” a child try a food. This one was especially hard for Nathan. He eats everything and hates wasting food. He has lots of “food rules”, but that’s for another post. He felt so strongly that our kids need to also eat everything. But throw up at the family dinner table is not fun for anyone. We had to let this one go. Let them skip baths. I used to think everyone HAD to take a bath every single day. I’m over it. In other countries, this is not even a thing. We smell heads and necks now to see how bad it is and then make a decision. Take soap and shampoo outside when they are playing with water on the trampoline and count it as baths. Also, the clothes get clean. Bribe them. A lot. And be okay with it. Again, they outnumber us. I don’t know what else to say to explain myself. Type their homework assignments or glue together their projects. Not too long ago, I couldn’t imagine taking my child’s handwritten assignment and typing it for them.Then one day, I watched a child typing. One. Word. A. Minute. I started doing the math, and realized that this assignment was going to take approximately seven hours. I took the computer away and whipped out that paper while she folded the basket of clothes for me. She could learn to type another day. Host a birthday party at Chuck E Cheese. The chaos. The excitement. The sensory overload. I hate it all. But the littlest princess of the family finally made me cave. I’m pretty sure Sam and Abby still hold a grudge that this was never even an option for them. Let a child paint the mailbox. Colors and designs that are loud and obnoxious. I’ve also let them paint the tree house and doors in bedrooms. I just don’t care anymore. Put preschoolers in front of screens with headphones on for hours at a time. Letting the screen babysit the kids. I cannot tell you how many flights and overseas meetings we survived in this way. I am convinced that at least one people group in the world would not have God’s story in their language had it not been for the ingenious use of a portable DVD player and headphones. So there. Try to argue with that reasoning. So now, make me feel better by telling me which of these you also do. And what are some other things you’ve done as a parent that you never thought you’d do? There are mermaids in my bathtub. And I really like them. When Lydia was three years old, she started loving the Barbie mermaids. She has three such plastic mermaids, pink and purple with long flowing hair. She used to enjoy playing with her mermaids in the swimming pool or bathtub. When the kids were little, it was sometimes handier to help them bathe in our bathroom instead of going upstairs. Lydia, being the youngest probably did that the most. 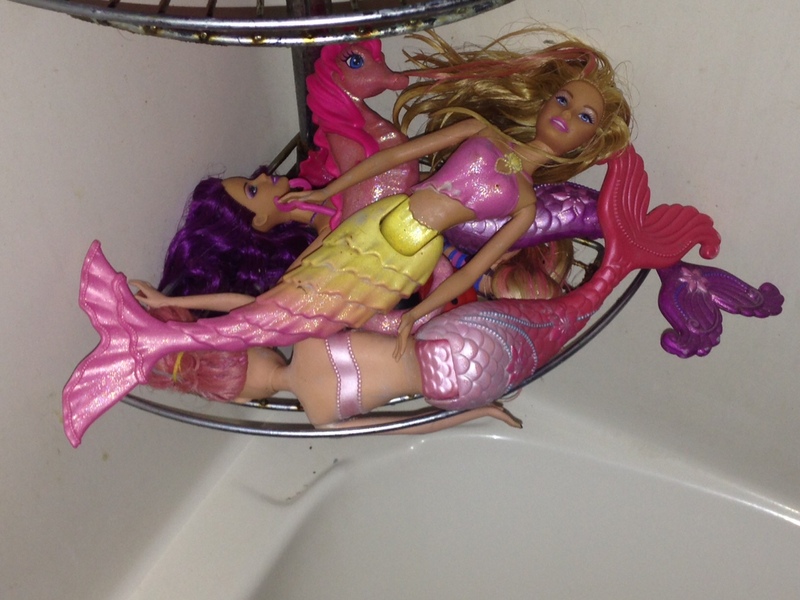 It was at that point that her mermaids came to live in our bathtub. I used to be frustrated about this. I wanted my adult bathroom and relaxing space without all the tear-free shampoo and toys everywhere. Nathan and I would inevitably find the mermaids with their sopping wet hair in the bottom of our tub when we were ready to use it. Since we have three kids sharing one bathroom, Lydia will sometimes still use our tub when we need to make a quick cleanliness turnaround. So we’ve kept the mermaids there for her, now on their own little shelf. Except no one has played with them for a couple of years now. And I can’t move them. Just can’t do it. For a while I told myself that Lydia surely still played with them when she bathed in there. Then I told myself that she might still want to play with them, so I should definitely leave them. Once I even checked the mermaids after her bath to see if they had wet hair. Because she could have secretly played with them and then put them neatly back in their spot. But the reality is that no one that lives at my house wants to play with mermaids anymore. Lydia is about to hit double digits. We have a house full of “big kids”. Our life has moved out of the mermaid phase and into a beautiful new phase that I equally love for a million reasons. But still, somehow it’s easier to just leave the mermaids where they are. Because those mermaids remind me of some things pretty special to my heart. Of little wet-headed girls with tangles that I gently combed out. Of their playful bath times with mermaids and tea parties and giggles. The feeling I had when I wrapped my girls in a towel and dried them off as they sat in my lap. When I see those mermaids, these memories feel closer. Their growing up doesn’t feel like it’s happening quite as quickly. My once-little-kids seem not so far away from me.